It was a wonderful Thanksgiving. One of those that I will remember for a long time. The day was a whirlwind of activity all though food preparations started the day before. Val made two pecan pies, Lynne made Jezebel Sauce (cranberry sauce enhanced with Dijon mustard and horseradish) and her wonderful wild rice stuffing, I stuffed pork loin with onions, porcini mushrooms, dried apples, cognac, herbs and ground pork; then covered it with prosciutto, set it on a rack of apple halves and poured hard cider in the roasting pan. 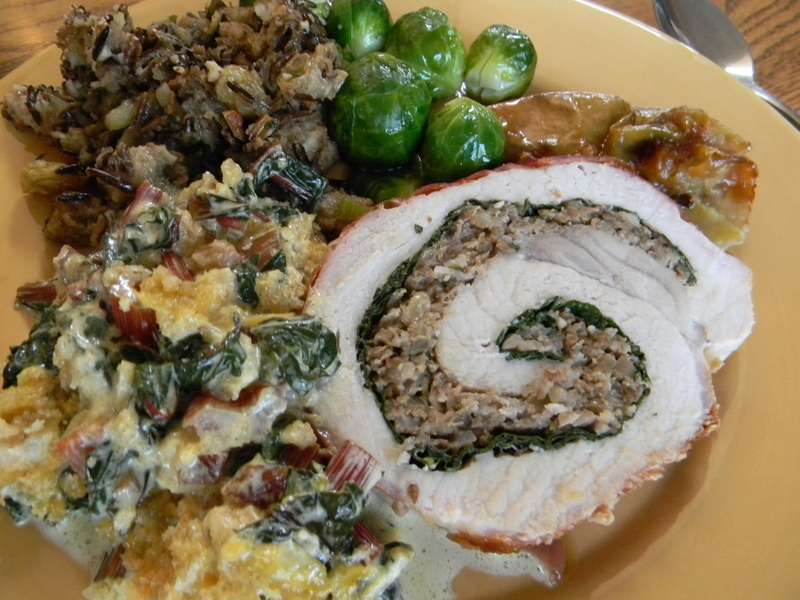 The meal was rounded out with Swiss chard casserole and Brussels sprouts with creamed Dijon sauce. 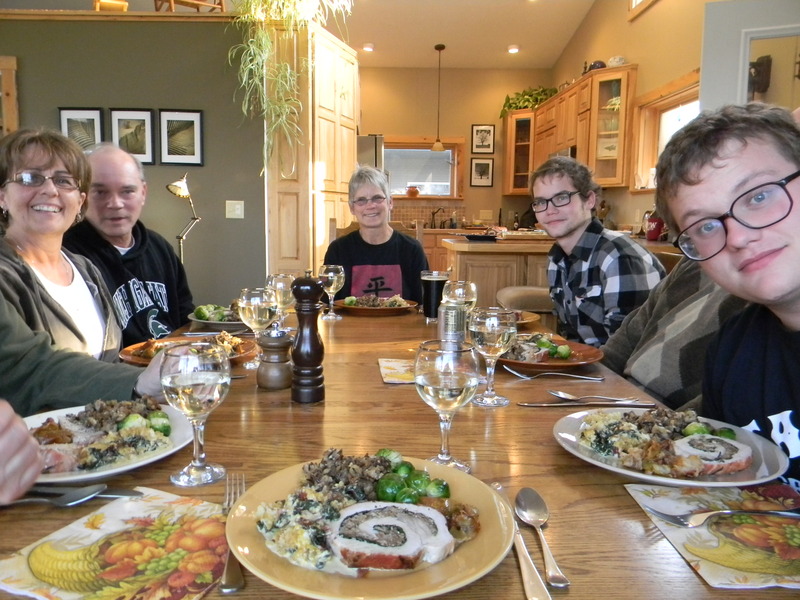 Our neighbor Lynne, who we also consider family, hosted our Thanksgiving feast. Also attending were Val’s older brother Gary, my older brother Bill and his girlfriend Deb, and our nephews Ian and Jake. We all differ in personality and political leanings, yet we are brought together by the ties of family and goodwill. I’m sure all of us consider how empty the holidays would be without these family connections. Families often are teachers of many things, including tolerance, diversity and above all love. Our acceptance of each other is sometimes challenged, yet we celebrate the the bonds of shared history. The art of listening can forge the way to a deeper understanding of each other. I started a tradition several years ago in a desire to focus on how gratitude informs each of our lives. We do this by going around the table and allowing each of us a moment to express gratitude. Although there may be minor resistance, each of us rises to the occasion (sometimes with emotion) to share how we are grateful. It is an opportunity to let each other know the importance of family and what is meaningful to us. The day of Thanksgiving is the threshold of the holiday season. Val and I have made a commitment to giving gifts that are handmade or local. In this season of intense commercialism we want to emphasize how easy it is to connect through life’s simplicity. Whether it’s a gift from our kitchen, the farm, our wood shop, or a local business, it will be a gift given with love. The next several days entail decorating our homes with the spirit of the holidays. Val & I have many cats, so we share a tree with Lynne. We love picking out and trimming our tree with ornaments that have been collected over many years. Lynne is a lover of all things related to the Peanut Gallery, so she has many Charlie Brown, Woodstock and Snoopy ornaments. I have collected Santa’s for decades (Val calls them my gray beard’s) so there are many Santa ornaments. In our own home we have a small grapevine tree and multiple Santa’s, wreaths and garland to help our rustic flavored home feel festive. As I grow older, it has become increasingly more important to feel gratitude each day; not just during the holiday season. I have become a person with a tender heart. In this troubled world so filled with commercialism, it’s not the possessions that we acquire over time, but the relationships to which we devote our time. Truck farming and living in the country has indeed slowed down the pace of our lives. It teaches us a simple, yet focused lifestyle that feeds not only ourselves, but the customers that support us. We learn to keep pace with the seasons and the land. May we continue to share great food with the people we love through out the year. Filling: Place dried mushrooms and dried apples in separate small bowls. Add 1 cup boiling water to each bowl. Let mushrooms and apples soak until very soft, about 30 minutes. Strain mushrooms. Cover and chill soaking liquid. Finely chop mushrooms and apples, combine in a small bowl, and set aside. Meanwhile, blanch kale in boiling salted water for 1 minute, until wilted. Using tongs, transfer kale to a bowl of ice water. Drain on paper towels once cooled completely. Remove any large ribs. Melt butter in a large skillet over medium heat. Add onion; cook, stirring often, until soft and golden, about 8 minutes. Add mushrooms and apples; cook, stirring occasionally until flavors meld, about 5 minutes. Stir in garlic, thyme and rosemary; cook for 1 minute. Add cognac and cook until liquid is absorbed, about 1 minute. Salt and pepper to taste. Transfer to bowl, let cool completely. Add ground pork and stir to combine well. Pork: Open butterflied pork loin, cover with plastic wrap. (If your pork loin is not butterflied, do the following: Put pork loin on a work surface with short end facing you. Holding a long, think sharp knife parallel to work surface and beginning along one long side, cut 1/2 inch above the underside of the loin. Continue slicing slowly inward, pulling back the meat with your free hand and unrolling the loin like a carpet, until the entire loin in flat.) Using a meat mallet, pound to an even thickness. Butterflied pork loin covered with kale and stuffing and ready to roll up. Uncover pork, season with salt and pepper. Place kale leaves on top of loin in an even layer, overlapping as needed and leaving a 1 inch border. Spread filling on top of kale. Roll pork into tight cylinder. Wrap one layer of prosciutto around roast. Tie roast securely with kitchen twine in 1 inch intervals. Tuck rosemary sprigs under twine, spacing apart. Roast can be made 1 day ahead. Cover and chill. Let stand at room temperature for one hour before continuing. Pork loin stuffed, tied and ready for searing. Preheat oven to 400 degrees. Place apples in a roasting pan. Melt 1 Tbsp butter with oil in a large skillet. Brown pork roast on all sides, about 5 minutes total, then set on top of apples. Add hard cider and 1/2 cup of water to skillet and bring to boil, scraping up any browned bits in pan. Pour mixture into roasting pan. Roast pork until an instant-read thermometer reaches 140 degrees, about 1 hour and 40 minutes. Let roast rest for at least 20-30 minutes. This entry was posted in Farm News, Recipes, Uncategorized and tagged dinner, farm, food, pork, recipes, Swiss chard, Thanksgiving, winter. Bookmark the permalink. What a gorgeous spread and a lovely home to enjoy it in. I knew we should have followed our noses that day! Brightest Blessings to all of you through the coming Yuletide and New year! Jim, DeLise, Paul. Felonious, Ayala, and lil Mia! Thanks so much Delise. May the season bring you peace and blessings as well. Agree Kim. I make a conscious effort on being and feeling grateful everyday. The food looks amazing! Tell Val the lavender soup is to die for and I love the night cream ! Peace and joy for you at the holidays! Thanks so much for your kind words Galyn! Gratitude certainly can keep you humble. Each day is a gift, what we do with it is up to us. Hope you and your family enjoy the holidays as well. It’s such a wonderful time. Why thank you Mary. Peace and joy to you for the holidays.